Pearse Doherty and Gerry Adams are in New York today. GERRY ADAMS AND PEARSE Doherty are in New York today for the annual Friends of Sinn Féin fundraising dinner. The event is expected to attract a crowd of around 600 with a ticket for the event costing $500 or around €403. The dinner was raised several times by Tánaiste Joan Burton in the Dáil today. During exchanges with Sinn Féin’s Mary Lou McDonald during Leaders’ Questions, Burton said that the cost of the dinner was more than what the average family would have to pay in water charges. Joan Burton says that SF is charging €500 for a dinner in New York that costs more than what the average water charges will be. 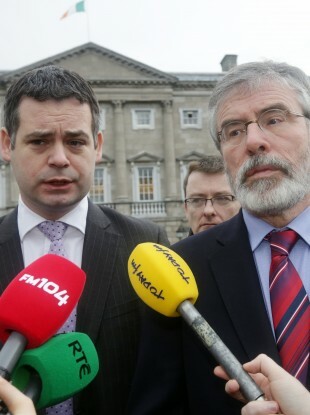 Sinn Féin has confirmed that Adams is in New York along with the party’s finance spokesperson Doherty. The party also confirmed the $500 price of the event which is taking place at the Sheraton Hotel in midtown Manhattan. Sinn Féin is reportedly expected to raise around $350,000 (€282,000) at the event. This afternoon the Labour TD Michael McCarthy said there needed to be transparency around Sinn Féin’s fundraising activities and an assurance that the money raised does not “leak into the coffers of the party here”. “Sinn Fein like to portray themselves as a party with the common touch, but that doesn’t prevent the likes of Gerry Adams and Pearse Doherty from jetting off to New York tonight for a €500-a-plate fundraising dinner, so that they can rub shoulders with some super-wealthy Americans,” he said. In response to McCarthy’s comments a Sinn Féin spokesperson said that the Friends of Sinn Féin is “fully transparent and compliant with US law”. According to IrishCentral.com, Sinn Fein set up its US fundraising organisation in the late 90s with other Friends of Sinn Fein (FOSF) organisations in Canada, Australia and Britain. Returns filed in the US show that FOSF raised $369,445 from November 2012 to April 2013 and $326,918 between April and June of last year. Total expenditure – which was mainly in travel and in maintaining a full-time office in New York – was listed as $258,486 from November 2012 to April last year. Adams is also due to address American labour movement leaders at an event in New York tomorrow evening. Email “Here's what we know about Sinn Féin's $500-a-plate New York dinner ”. Feedback on “Here's what we know about Sinn Féin's $500-a-plate New York dinner ”.